With spring in the air and summer looming on the horizon, the smokers and grills are out in force. While the traditional fare of burgers, brats, dogs and barbecue create mouthwatering meals, there is a less traditional, albeit no less tasty barbecuing option. 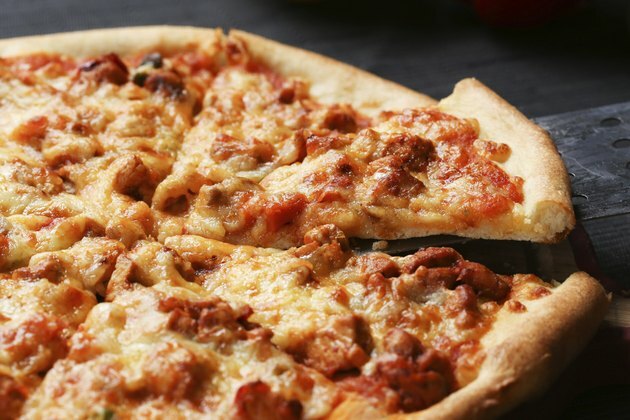 Barbecue pizza cooked on a smoker grill gives your pizza traditional smoky flavor with a modern twist. If you are looking to find a creative way to wow your guests, crank up the barbecue, let your guests create their pizzas, and in approximately an hour and a half, you will be eating smoky, flavorful barbecue pizzas. Light a fire in the smoker, and let your charcoal burn down, then add in your favorite smoking wood. Keep the wood and smoke to a minimum, otherwise you may overpower the pizza with too much smoke, and try to keep the smoker temperature around 250 degrees Fahrenheit. Take your ball of pizza dough and pull it apart into an even amount of golf ball-sized pieces. Dust a clean counter with flour, and, using a rolling pin, roll out each of your pizza dough pieces into small 6-inch pizzas. Once the smoker is hot, and your pizza dough is ready, place your pizza on a serving dish, and lightly brush your pizza dough with your favorite barbecue sauce, adding pizza sauce over that. Sprinkle with mozzarella cheese, and then add your favorite pizza toppings to the top. Carry your pizza to the smoker, and slide the dressed pizza on the lowest rack first, right on top of the grate. Cover the smoker, and let the pizza cook for 60 minutes or until the bottom of the crust looks crispy. Remove the pizza to the top rack, and finish off the pizza for another 30 minutes or until the cheese is melted and the pizza is hot and bubbly. Remove the pizza from the smoker and place back on a serving dish. Be certain to wait a few minutes to dig in as the melted cheese, meat and vegetables will be very hot. You can use whatever pizza dough you prefer. Options range from creating your own homemade pizza dough to buying prepared pizza dough. You can also change your cheese from mozzarella to goat cheese for a zesty California-type pizza. Add in pineapple and chicken for a more Hawaiian flavor. Do not use a water smoker, as the steam could keep the dough from getting crispy, and it may not cook well.